Over the history of baseball, there have been myriad players who have been, deservedly or undeservedly, tagged with the moniker of “goat.” These competitors have been involved in circumstances that changed outcomes at critical instances in momentous games. Two of the most famous such persons, Ralph Branca and Bill Buckner, have direct ties to the subject of this essay, another individual to suffer the ignominy, Mike Torrez. While Torrez’s “moment” did not end the game in question, as did Branca’s and Buckner’s, it helped add even more years to Boston Red Sox fans’ residence in baseball purgatory. As the Yankees garnered three consecutive American League pennants over the years of 1976-1978, they claimed World Series banners in the last two years of the run. 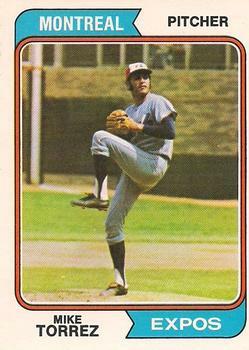 It is not incorrect to argue that Torrez played significant roles in both triumphs; once while he donned pinstripes (in 1977) and won two games in the World Series, the other, while pitching for New York’s most bitter rival. Even now, in 2019, (and after winning titles in 2004, 2007, 2013 and 2018) anywhere and any time members of “Red Sox Nation” gather, “the pitch” by Torrez to Bucky “Bleeping” Dent on October 2, 1978 is a certain topic of conversation. That Sox team, which had a 14 game lead in the American League East standings in the middle of July, frittered this advantage away and then lost a one-game playoff at Fenway Park. A man who had been viewed as a savior, the last piece of the puzzle to get the Red Sox over the hump against the Yankees (and who signed, by the standard of the times, a huge free agent contract), wound up taking the (undue) brunt of the blame for the epic collapse. Mike continued to toil for Boston until 1983, then went on to play for the Mets, and was not invited back to Fenway Park until the centennial celebration in 2012. He has never returned. By the late 1950s, Mike had played Cosmopolitan, Little, and Colt level leagues, and later, American Legion. He also played basketball in “Mexican” tournaments throughout the Midwest; often teaming with his older brother John, himself a regional softball legend. Additionally, Mike played for on the court for the Topeka High Trojans. He never played baseball for his alma mater, as they did not field a team during his high school years. By 1964, the now 18-year old Torrez had just completed an American Legion season in which he went 13-1 and lead the Eastern Kansas All-Stars to victories against teams from the western section of the Sunflower State and other regional squads. He pitched an impressive game against a team from Nebraska, in which Mike struck out 18 and gave up only a bunt single. Torrez was featured on the cover of Sports Illustrated prior to the start of the 1968 season which discussed the potential of several “hot rookies.” He made the club, and earned his first victory, 9-2 against the Cubs, on April 19. By late May, he sported a 2-1 mark with a 2.64 ERA. Unfortunately, other pitchers on the staff of the defending champions also did very well, and after seven weeks of the campaign, he had logged only 17⅓ innings. A troubling relief appearance against the Phillies (where he issued three walks in 1 2/3 innings) convinced Cardinals General Manager Bing Devine and Manager Red Schoendienst that the only way to provide Torrez with regular work was to send him back down to Tulsa. One of the highlights in spring training of 1969 for Torrez was the opportunity to pitch against the Royals in their first home appearance. This 1-0 victory raised his spring record to 4-1 and made it possible for him to join the team as one of their starters. Given the opportunity to learn from greats such as Gibson, Torrez eagerly anticipated his time in St. Louis. “When I first got up to the big leagues, I wanted to find out what made these guys successful…So, I was always asking questions. I always wanted to learn.”8 Mike finished that year with a 10-4 mark, and an ERA of 3.59. Overall, however, the Cardinals fell back from being NL Champs to a fourth-place finish in the newly minted National League East Division. In 1970, Mike came close to pitching the first National League St. Louis no-hitter since 1924, as he blanked the Expos 10-0. He also went three-for-three at the plate and had an RBI. This victory was his 11th consecutive triumph (he won his last nine decisions in 1969 and the first two in 1970). This was the high point of Mike’s time in St. Louis.9 Less than one year later, however, things would be totally different. Not only would he be gone from Missouri, he would be pitching for an abysmally poor minor league team in Manitoba. Going into the 1970 season, the projected starters for the Cardinals lined up like this: Gibson, Carlton, Briles and Torrez; how and why had things gone so wrong? 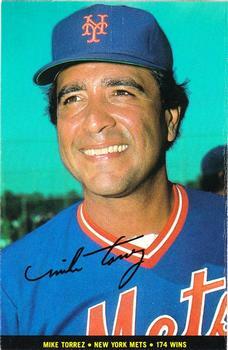 The only consistency for Mike Torrez in 1970 was his inconsistency. One of the lowlights of that year was a June 20 game against the Cubs where Mike lasted but ⅓ of an inning and in which he surrendered six earned runs. By the All-Star break, he was 6-8. Matters did not improve subsequently Overall, he finished with a mark of 8-10 and an ERA of 4.22.10 Going into 1971, Torrez was concerned that he would lose his spot as the fourth starter. One positive that did come from 1973 was that Mike met, and eventually married Danielle Gagnon, a Quebec native While the ties to his manager were strained, he now had even closer ties to Montreal In 1974, those tensions continued, though Torrez improved to 15-8 and a 3.57 ERA. Still, there were rumors that a clubhouse purge was imminent, and that Mike would be one of the individuals moved. Amidst all the turmoil of his third team in three years, Mike proved himself again in 1976. While he did not win as many games, finishing 16-12, he did record his best ERA in the Majors: 2.50. The surprising A’s had one more run in them, though they ultimately failed to catch the Kansas City Royals for the American League West title. Mike was at the heart of the improbable surge, as he went from being 6-9 to becoming the best pitcher in baseball during the last months of the season. He even had three consecutive complete-game shutouts during the stretch. As he continued to pitch effectively, he made it clear that he would not re-sign with the A’s beyond 1977. In 1976, Torrez’s salary totaled $83,000. Charlie Finley had the right to cut his salary by up to 20 precent at the end of the season. Then something surprising happened, when the contract arrived in November. Mike noticed that Finley had instead increased his salary to around $100,000 (a 20% increase). The stingy Finley (who was basically running the entire A’s office as a one-man show) had mistakenly typed in the wrong amount. 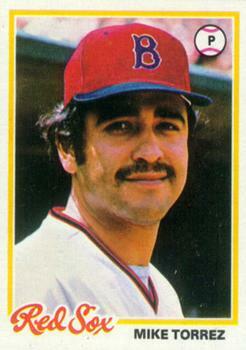 In the midst of the “Bronx Zoo” Mike Torrez saw an opportunity to finally make what he termed “big money.” Although this year was punctuated with many wild events, including the June 18 incident at Fenway Park in which Billy Martin pulled Reggie Jackson, 1977 would be the highlight of Torrez’s career. Mike Torrez’s success with the Yankees came about at just the right time in baseball history. He would leave New York and become one of the first “blue chip” free agents; signing with Boston for the then astronomical amount of $2.5 million over seven years.19 At the start of 1978 it appeared to New Englanders that he was worth every penny, and then some. Their assessment would change by the time the leaves turned, however. With a rotation of Luis Tiant, Bill Lee, Dennis Eckersley, and Torrez, plus a powerful offense, the Red Sox, who finished just 2½ games behind New York the previous season appeared more than ready to challenge their rivals. Mike got off to a good start, but then again so did the whole team. By the All-Star break, Boston sported a mark of 57-26 and an 11½ game bulge over the Yankees. Mike’s mark stood at 11-4, and overall, the Red Sox starters were 36-7. Still, all was not perfect as, for example, there were increasing tensions between “Spaceman” Bill Lee and Manager Don Zimmer. In the latter months of the season, as the 14-game lead melted way, things became even more heated. The low-point (before the loss in the one-game playoff) was undoubtedly the “Boston Massacre” which took place during September 7-10, in which the Yankees pounded the Red Sox for a four-game sweep in Fenway Park, pulling them into a tie for first place. The contest on October 2, 1978, is one of the most memorable in history. The Red Sox broke through early and for six innings all went as Sox fans hoped. The Sox led 2-0 going into inning 7, and Mike had tossed only 66 pitches and allowed two hits. After erasing Graig Nettles in a fly out, Chris Chambliss singled and Roy White did likewise. Next, Torrez induced a fly out by Jim Spencer. The next hitter was Bucky Dent. The Yankee shortstop fouled off the second offering of his at-bat off of the instep of his left foot. As he hobbled to the dugout for treatment, teammate Mickey Rivers noticed that Dent’s bat was cracked. He offered one owned by Roy White and told his teammate that “there are lots of hits in it.” There was at least one more. The next four seasons were difficult, to say the least. After 1978, Torrez’s career mark stood at 141-118 (.544). After “the pitch,” he went 44-42 (for a final mark of 185-160). The Boston fans, however, eventually took their frustrations out on him. Things got progressively worse. He finished 1979 with the same record as the previous year, 16-13, though his ERA increased from 3.96 to 4.49. The Red Sox, however, did not compete for the divisional title, which the Orioles claimed. In 1980, a portent of things to come came in Mike’s first start, against Milwaukee, in which he lasted barely one inning. The final score was 18-1. That season, his ERA climbed to as high as 6.49, and finished at 5.08. His record cratered to 9-16. By season’s end, Zimmer had relegated Mike to the bullpen. In addition to the problems on the field, this season saw the end of Torrez’s second marriage, with the final dissolution coming in April of 1981. The next two years were a bit better, though Boston again did not make the playoffs. A new manager, Ralph Houk, offered a possibility for rebooting Mike’s career and after a slow start (1-2 with a 6.50 ERA) he finished with a 10-3 mark and an ERA of 3.68. Given the work stoppage that season, the team lost 54 games to the labor action. Perhaps things might have been different for Boston and Torrez if not for the truncated campaign. The positives from 1981 did not continue into 1982. Mike should have known things were going to be bad as, even after a solid year, he was paged at the Boston Garden (during a Celtics game) and was roundly booed by those in attendance. He finished the year with a record of 9-9, but with an ERA of 5.23. It was clear, after the 1982 season, that the Red Sox were ready to move on.22 One positive in his last season with the Red Sox, Mike married again, to Teresa Wilson. Dennis Eckersley served as his best man. Mike was named the number one starter for the Mets for 1984, but the youth movement continued apace. In his first start, he lasted only 1⅓ innings and gave up three runs. Mike’s next start would come on April 8. This event would be memorable, but for a very tragic reason. A Torrez fastball struck Dickie Thon “square in the face” and severely curtailed the young Puerto Rican’s career. A supreme irony was that the Mets had once plotted to acquire Thon from his then-employer, the California Angels, in a trade for pitcher Craig Swan, but the deal fell through. Had it worked, Torrez and Thon would have been teammates. Mike’s time with the New York came to an end shortly thereafter, with him pitching in only seven more games. By early June, his record stood at 0-5 with a 4.40 ERA. His final appearance for New York took place on June 12, and his ERA had increased to 5.02. He was not quite done in the Majors, as the A’s came calling one more time. As of 2018 Mike and Teresa had returned to Florida. They had two sons, Michael and Wesley. The younger Wesley hoped to continue the family tradition in pitching. He has played in the minors as well as the Mexican League. Mike also had a son, Yannick, with Danielle and a daughter, Christiann, with his first wife, Connie. A good way to summarize his career is that he won more games than the vast majority of hurlers who have pitched in the majors. Mike Torrez also has a World Series ring to his credit, along with the rare feat of two complete-game World Series wins, as well as a place within some of the most historic years of baseball history. Overall, this is not a bad legacy. By the early 2000s even some Red Sox fans had come around to an extent. Surprisingly, in 2004 a fan publication slotted Mike as ranking as number 95 among the “Top 100 Red Sox” players ever.27 Torrez is highly regarded and respected in his hometown and state. He often goes back to his old neighborhood and works with community leaders. He is seen as a role model for the Latino/Mexican American population of Kansas. He also regularly attends the Yankees’ Old-Timers Days, and even toes the rubber for a few pitches. This biography was reviewed by David Lippman and fact-checked by Kevin Larkin. 1 The materials cited here come from a biography of Mike Torrez. Please see: Jorge Iber, Mike Torrez: A Baseball Biography (Jefferson, NC: McFarland and Company, Inc. Publishers, 2016), 43-50.